Are Protests Against Bashir Regime Doomed to Fail? Confrontation between police and protesters in Khartoum (file photo). Nairobi — Sudanese security forces have been using live ammunition and other forms of excessive force against protesters and arbitrarily detaining them. Sudanese activists and medical workers estimate that at least 40 people have been killed, including children, since protests began on December 19, 2018. The Sudanese authorities should investigate all reported killings, injuries and other abuses, and hold those responsible to account. "Sudanese have the right to protest peacefully and express their views without risking life or limb or getting locked up," saidJehanne Henry, associate Africa director at Human Rights Watch. "The government should release detainees, or charge them with what they are alleged to have done, respect due process, and carry out a full impartial investigation into all reported abuses." Protesters have taken to the streets in towns and cities across Sudan to protest price increases and to call on President Omar al-Bashir, in power for 29 years, to step down. The protests began in Atbara and have spread to other cities and towns, including Gedarif, Wad Madani, Port Sudan, Dongola, El Obeid, El Fasher, Khartoum, and Omdurman. Al-Bashir is wanted by the International Criminal Court for genocide, crimes against humanity, and war crimes in Darfur. Sudan authorities deployed national security forces, the police, and the paramilitary Rapid Support Forces to quell the protests. In many places, they used excessive force to disperse unarmed protesters, beating them with batons and firing live ammunition, rubber bullets, and teargas. Images and video clips recorded by activists and circulated on social media and on news outlets show government forces , shooting live ammunition at unarmed protesters and bystanders, beating unarmed civilians, and evidence of gruesome, often bloody injuries. One of the clips shows a man with a gunshot wound to the head being rushed to hospital on December 25, reportedly shot by snipers from rooftops. Security forces have rounded up and arrested hundreds of protesters - including journalists, doctors, university professors, and opposition party members - from the streets, offices, homes, and while they were attending meetings. While many were released after several hours, scores remain in detention without charge and without access to visits from family, lawyers or doctors, including people with severe injuries, according relatives of those detained. On January 5, 2019, a group of 12 security force members arrested Yasser Ali, 57, at his home where he was recuperating after he was . Ali spent nine days in a hospital. The security forces are detaining him in an unknown location, his family said. Family members said he requires further surgery outside the country but authorities have not allowed him to travel or have access to lawyer or family visits. Mohamed Naji al-Asim, 28, who has spoken to media on behalf of the Sudanese Professionals Association, a group that called for protests, was arrested on January 4 in Khartoum and remains in detention, according to activists and family members. Dr. Husham Omer el-Nour, a professor at Nilein University, was arrested on January 1 while asking the authorities to release his brother, Haytham al-Nour, an engineer. Both men remain in detention. Opposition party leaders, including Omer el-Digeir, head of the Sudan Congress Party and Communist Party members Masoud Mohamed el-Hassan and 88-year-old Siddig Yousif, have remained in detention since December 27 and 28, respectively. Medical professionals have also been targeted for harassment and arrest, and doctors are among the detainees. Dozens of journalists, including Faisal Mohamed Salah, a prominent journalist and commentator, were detained and warned to stop reporting. In early January, a female journalist reported that security officers assaulted her while trying to stop her from reporting at a protest site for international media outlets. Authorities have also censored newspapers, confiscating print runs and blocked access to the internet, and in late December they expelled the Cairo-based al-Araby television crew from the country for their reporting. All detainees are at risk of abuse and torture, Human Rights Watch said. 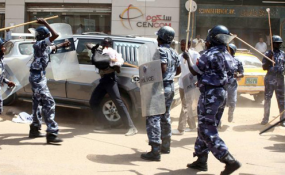 Sudan's national security agency, the National Intelligence and Security Service (NISS) is well-known for abuses against detainees - particularly during repeated waves of protests since 2011, including prolonged detention without charge and verbal and physical abuse. A large group of Darfur students accused by national security head, Salah Gosh, of belonging to a "sabotage cell" are especially at risk. Since December 20, security forces have rounded up more than 50 Darfuri students in house raids in Sennar and Khartoum and are detaining them in unknown locations. The students have not been charged with any crimes, lawyers following the case told Human Rights Watch. The authorities should reveal the students' whereabouts and release them immediately or charge them with credible offenses and guarantee them their full due process rights, Human Rights Watch said. Government officials acknowledge that 19 people were killed and over 800 arrested since protests began but blame the protesters and "saboteurs" for the violence. On December 31, Al-Bashir announced an investigation into the events. Any investigation should be independent, impartial, public, and yield recommendations for real accountability, Human Rights Watch said. In 2013, during Sudan's violent crackdown on protests, more than 170 protesters were killed, most by bullet wounds, but the investigation did not result in any credible prosecutions. "The familiar tactic of violence and abuses to silence dissent will not solve any of Sudan's problems," Henry said. "Sudan's leaders should unambiguously call a halt to the violence, release detainees, ensure justice for the victims, and engage peacefully with the protesters' concerns."